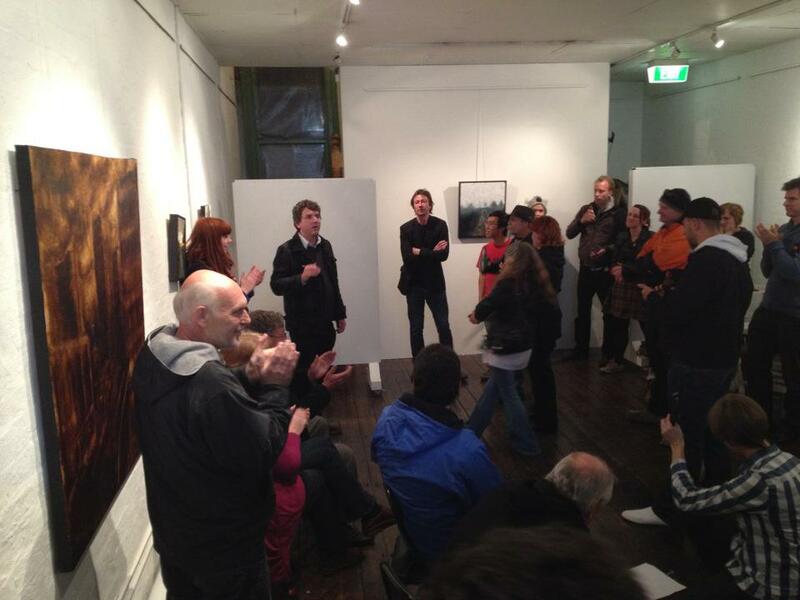 Socialist Party candidate Anthony Main speaks at an election night party. Elections for local councils across the Australian state of Victoria took place on October 27. Socialist candidates scored major gains. The Socialist Party, standing in all three wards in the inner-Melbourne City of Yarra, won its highest ever vote – up 58 percent on 2008. SP councillor Stephen Jolly was re-elected under the Single-Transferrable Vote (STV) system, topping the poll with more first preference votes than any other candidate. Socialist Alliance candidates, running in the northern Melbourne suburbs of Moreland and in the regional city of Geelong, scored the party’s best results in Victoria. Sue Bolton came third highest in the tally of first preference votes, out of 24 candidates. And under STV she was elected to Moreland City Council as the most preferred candidate overall for her ward. In Geelong, Sue Bull won over 10,000 first preference votes (8 percent of the total) in the mayoral election. Yet in a country where voting is compulsory, around a quarter of registered electors didn’t cast a vote. Commenting on the low turnout, Monash senior politics lecturer Nick Economou observed, “If people do not believe the system is relevant to them, they won’t turn up, even if there is a threat of a fine”. Institute of Public Affairs spokesperson James Paterson called for voluntary voting, adding, “We don’t believe people should be compelled to cast a vote for a party they don’t agree with”. The largest socialist group in Melbourne maintains that elections shouldn’t be a focus for activists, and may even be a distraction from the “real” struggle. Sadly, their abstention meant that voters only had the option of supporting socialist candidates, campaigning to radically transform the system, in three out of Victoria’s 79 council areas. But the strong results for the SP and SA show the opportunity – and the need – for activists to connect with community members through elections. The Greens failed to gain significantly from voter disillusionment with the two-party system. The Australian Greens were hoping for major gains to flow from voter disillusionment with the two-party system, dominated by Labor and Liberal Party members standing as “independents”. But the Green Party failed to connect with working class voters and fill the political vacuum. Coupled with growing experience of Greens in office, and their patchy record at providing an alternative to “business as usual”, the party came out of the Victorian elections with 20 councillors – up by just one on 2008. Sitting Green councillors were dumped in areas ranging from inner-city Port Phillip to outer suburban Casey City. In Yarra, the former Green Party mayor was not returned to council, after repeatedly bowing to developers, leaning on protesters to abandon an offshoot from Occupy Melbourne, and supporting above-inflation rate rises for residents while cutting services and trumpeting Yarra’s debt-free balance sheet. By contrast, both the Socialist Party and Socialist Alliance stood on a platforms of turning city councils into “campaigning councils”. Their vision was not to administer in accordance with the neoliberal framework set by state and federal governments, but to challenge higher authorities to give residents more control over issues – like transport – which impact on them. “We pledge to offer people the type of fighting representation that they need to take on a hostile State Government, cashed up developers and an unhelpful bureaucracy”, said the SP election leaflet. “We need a council that stands up for residents against greedy developers and the anti-people policies of the state and federal governments”, said the Socialist Alliance. Socialist Party councillor Stephen Jolly speaks at Occupy Melbourne. Socialist Party member Simon explained to The Spark that the party and councillor Stephen Jolly first gained a public profile in the area through their lead role in saving Richmond Secondary College in the 1990s. For almost a year, community activists occupied the school to stop its demolition. Volunteer qualified teachers kept the school open for students after it was “closed”, until the state government relented and re-opened it. 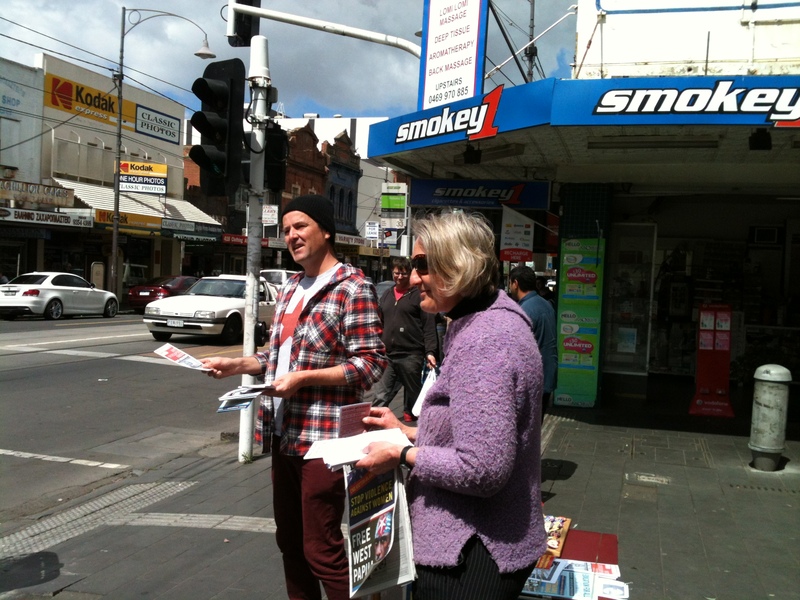 Since then, the small Socialist Party has concentrated much of its activity in Yarra neighbourhoods. Represented on council since 2004, the SP has recently organised successful community campaigns to save two community centres, to defend green space in public housing estates from private developers and to reverse a decision to close council-run childcare services. It has led community protests against a proposed new motorway tunnel into Yarra and won support for a council-funded public transport campaign. It has also worked to unionise the staff in the many small bars and cafes in the suburb of Fitzroy and supported other union struggles. The SP has built a mighty reputation and huge networks locally, so that it was able to mobilise over 150 members and supporters for its council election campaign. 90,000 leaflets were distributed to homes. 15,000 doors – around a third of the electorate – were visited. Socialist Party posters were everywhere. As well as proposing policies like planning which puts residents before developers, real action on climate change, defending and extending council services, support for public housing and understanding cost of living pressures, the party was also able to campaign on its long record of successfully defending residents at neighbourhood level. The Socialist Alliance took a different approach in Moreland City. As a party which campaigns more around national and international issues and which stands in general elections across Australia, its local knowledge and links were not as strong. As a prominent social movement campaigner in Victoria, candidate Sue Bolton did have a profile in parts of the Moreland community. She was known to local union activists through her role in the Northern Communities Union Solidarity Group, while work in solidarity with Palestine and the Arab Spring uprisings had forged connections with Muslim community members. Refugee rights campaigning centred on the detention centre in Broadmeadows brought her contacts in new migrant communities, adding to long-standing links with the Kurdish and Turkish groups. 40 percent of Moreland City’s population were born outside Australia. The Socialist Alliance had also stood in previous elections for council and for state and federal government. The Socialist Alliance letterboxed every house in the ward with their first leaflet, and around 25% received a second “how to vote” leaflet. There were weekly stalls in two shopping areas and a small amount of door-knocking. Train stations were leafleted at morning rush hour. “There was also a backlash against Labor and the Greens”, explained Sue. “The sitting Green councillor, who didn’t seek re-election, was responsible for a string of pro-development decisions against the wishes of the community”. A veteran Labor Party councillor in the ward lost his seat. The first preference vote for the lead Green candidate dropped from 18 to 14 percent, mirroring falls across Moreland. On election day, there were Greens and Socialist Alliance supporters cooperating at some polling booths, jointly handing out both parties’ “how to vote” cards. “This result lifts the morale of people who identify with socialist and left progressive politics”, said Sue. “The capitalist class socks it to people relentlessly. They can lose confidence in struggle. They don’t see the potential for a left alternative to Labor and the Greens. Sue’s first act as elected councillor was to call on supporters to join her at a successful protest against the deportation of a Tamil asylum seeker back to probable torture in Sri Lanka. 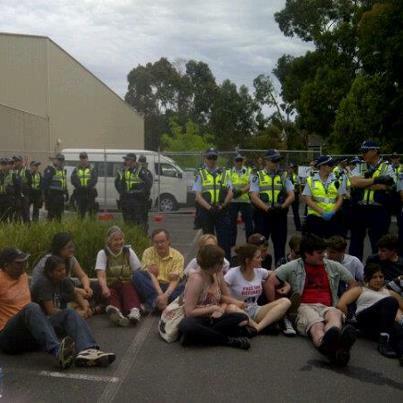 Socialist Alliance councillor Sue Bolton participated in a successful blockade of a detention centre aiming to deport a Tamil refugee. Interesting summary of many of the disagreements on approach. I have to say, as an SP member, we criticise the Greens as a party because the things they do – supporting rate rises, privatisation (on local and state levels) etc – flow directly from their nature as a capitalist party. If we were to hand out with the Greens during elections, we would lose much of our credibility amongst the ordinary people to whom we should be talking; including those in the Greens becoming alienated by their performance in practice. The other point I wanted to make is more of a correction: the protest at the refugee centre was not actually successful at all. They removed the man in question through a back gate – he was gone while the protesters where still there. He was saved from deportation by a last minute legal decision – I think you’ll agree, not a stable or safe outcome. The next attempt to deport him will have to be met with more resistance. David’s comment above raises the interesting question of how socialists should relate to the Greens. My intention in the short article was not to debate this question, but to report the socialist gains, and describe how they were achieved in the two main areas and what they mean politically. However, since David has brought it up, I will offer some thoughts in reply. I think the approach to the Greens involves tactical considerations. That is, it depends to some extent on time and place. In the 2011 general election in Ireland, for example, socialists were clearly right to attack the Irish Green Party, which had gone into a coalition government led by the conservative, centre-right Fianna Fáil party, presided over bank bailouts and imposed a harsh austerity plan at the behest of the EU and IMF. In the Yarra council election, I joined the large Socialist Party team on polling day, handing out SP how-to-vote cards at a polling booth at the Richmond housing estate. A small Labor group were there too, and a sole Green Party activist. This was the first thing that struck me – the balance of forces on the ground, at least in the public housing estates. The second thing that struck me is that the SP group *looked like* the culturally diverse, working class people who were lining up to vote. There was an easy exchange, and long chats in different languages, between SP activists and local people. The white, smarty-dressed Green Party person, however, looked like a landlord and seemed very uncomfortable being there. I am no expert on local conditions in Yarra. But this experience, coupled with the Greens’ record on council (mentioned in the article) persuaded me that the SP approach may be tactically correct there. I am not so convinced, however, that it’s right across Australia as a whole at this time (or in New Zealand, for that matter). In large parts of Australasia, I think the Greens are seen as a left alternative to Labour. This is partly a matter of perception – which is itself politically significant – but not entirely. I noticed, for example, that Federal Greens MP Adam Bandt spoke at a public meeting organised by the Refugee Action Collective at Melbourne University in August, titled, “SMASH THE MALAYSIA DEAL: REFUGEES ARE WELCOME HERE”. The RAC is the main organising coalition in defence of refugees and asylum seekers, involving Greens and all the socialist groups working together. 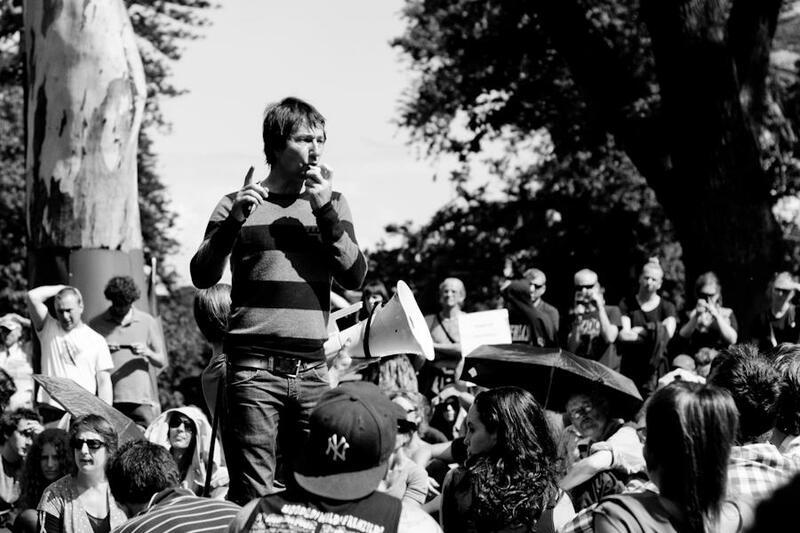 In New Zealand, the Greens have established significant links in the trade unions. As I say, I think there are tactical considerations involved, which require concrete analysis of the role of the Greens at any given time and place. This will become increasingly important in New Zealand, especially if – as now seems possible – the next election delivers a Labour-Green “neoliberal-lite” government. I think the approach taken by Lenin to the “capitalist workers parties” of the 1920s in his book “Left Wing Communism” remains a useful example for us today. Overall I think your article is a very well written account Grant. We do have to relate to the Greens which was reflected by the SP’s preference for the Greens over Labour but I have to disagree with the SA tactic of mutual support. The Greens Federally have already precided over austerity measures and have repeated this performance at the council level.They have justifiably as you noted suffered as a result. In Tasmania they are now in cahoots with the ALP to privatise the electricity grid. This all flows from their acceptance of the capitalist market and their disconnect from class politics. In a friendly exchange with one of their activists at a pre polling booth I explained that the key difference between us lay simply with the logic that you cannot hope to build a sustainable economic system without fighting for a qualitative restructuring of the economic system. As we know you cannot have a better society without an economy that through the revolutionary action of the producers the working class transforms the very nature of the productive system and its property relations and begins the transformation of the market to planning by the nationalisation of the key top corporations. The Green activist remarked that most of their support comes from x labour voters I replied that once the best of the Greens come to realise that to even begin to build mass scale solar thermal power stations will require the working class and its allies to win political power and that this power will be mainfested in the end of capitalist ownership by socialised ownership by the workingclass many of our new recruits will be x Green voters. I don’t believe you alienate Green supporters by getting them to thing more deeply about both the actions and the fundamentally undemocratic nature of their party. It’s by mastering the correct use of the united front tactic that we will win the best of the Greens to a socialist program, I’m afraid the SA approach bears all the hall marks of the popular front. I know Adam Bandt from his youth, he has travelled a long way from his Marxist sympathies, have you read his latest writings where he compares the fight to save the environment to the ‘collective effort’ to put a man on the moon. FFS! When the Greens were recently attacked by the Catholic private school lobby Adam reassured them that the Greens would not only not touch their huge cut from the public purse but increase it. The Greens opportunism is already their for anyone willing to see. If the Greens here refused to enter into coalitions with ALP then you could argue that their was a possibility of them transforming into a genuine social Democratic Party which is a rare political phenomena but this did happen in the case of the ANC but this is not the case. Genuine socialism as you well know is about trying to both comprehend and tell the truth, it is this truthfulness combined with exemplary practice that will win the Greens to our banner. I hope SA does a good job as councillors and already they are talking to us about how to work together but I imagine problems will arise. We were heavily criticised for not being willing to fight for a boycott of Iraeli goods at a council level. We correctly understood that this issue was miles away from the political consciousness of the majority of Yarra residents and was far from the issues that currently needed to be addressed. To use an analogy Left wing union leaderships often pass progressive motions that due to the unions totally undemocratic structures in no way reflect the actual political consciousness of the membership. We could of pushed this political barrow and simply helped alienate ourselves from our base whose political level we unlike SA and co have a pretty accurate gauge of. My friendly advice to SA and this is not official SP politics is that your first task is to listen to and act on the pressing needs of your constituents and not try to artificially impose a the current left wing agenda. Maybe Moreland will wont to support a boycott but an exstensive campaign to win locals to this position would have to carried out first. But if SA chooses to do this at exspense of the immediate issues such as the fight for a re establishment of a high school in Coburg to name one they will simply alienate themselves from the locals and be seen as trying to impose their own agenda. I hope they get their practise right and help give socialism the good name it deserves. But once again it was a pleasure to meet you Grant I will have to subscribe to The Spark. Totally non-political, but can you use line breaks to break up your piece next time? That was hard to read.